Marc has sent in a question. “It would be interesting to find out the original publication of 33, ‘Het gebeurde in Parkzicht’. That is one of the best stories I’ve ever read in Tina. It’s a hospital/nurse story, in which several storylines were going on at the same time. It lasted for 15 episodes (45 pages) in early 1977. But I think the original might have lasted even longer, because the end we got offered is satisfactory, but you feel there could have been more after it. Here is a scan from the Dutch translation – the first page of the story, taken from Catawiki. Does anyone have any ideas on what the original might have been? NB the Dutch story title translates literally to “It Happened In Parkview”. Recently-joined reader Orangetree has sent in scans of the Indonesian translation, just called “Sonya”. It is clearly drawn for a British publication originally, as the policemen wear the typical helmet. No further clues from the title page or other publisher information, sadly. This was the second-to-last Jinty annual, and it is also the first to really show the decline in her annuals. The previous annual had been the last to feature Jinty material; this one begins a fallback on reprints that are not even Jinty. They look like they have been taken from older material, probably June, Girls Crystal or whatever. The artwork from Jim Baikie and Ken Houghton looks like it came from their early days as it looks less developed and sophisticated than their regular Jinty artwork. The Diane Gabbot artwork in “Freckles” also looks like it is some of her earlier artwork. Even the cartoons have been taken from elsewhere, and there is no Snoopa or Alley Cat to be seen. The annual is Jinty in name only. Why such a decline when Jinty’s sister titles Misty and Tammy still featured and reprinted their own material in their own annuals? Was it due to legal reasons, economics, or other editorial decisions? What makes a story work, pt 3? Following on from my earlier posts, more about what makes a story work. The discussion points in this post are more focused on the work of the artist, whereas the ones in the previous post were more around what the writer does. Art quality. Is the art convincing and solid, with movement and vigour where required? Can the artist actually follow-through on technical requirements such as drawing ballet steps, gymnastics, and horses? Or is it inaccurate, stiff, or lifeless? Of course this is primarily the artist’s responsibility, but there is some input from editorial departments. They may ensure, for instance, that art drawn by Spanish artists matches the British location that most stories are supposed to take place in by adding in pillar boxes and the like. Few artists in Jinty and other comics of this era are anything other than good to extremely good, so overall art quality is normally not a factor in the story not working. However, the artist may have specific gaps in what they can and can’t draw convincingly. Stronger: There are so many strong artists that it is difficult to pick out one over the other except on the basis of personal preference. Mario Capaldi can draw faces, action sequences, and solidly convincing backgrounds, and is almost universally loved, but you could also say the same of my personal favourites Trini Tinturé, Phil Gascoine, and Phil Townsend. I think perhaps my favourite art on all the stories might however be Terry Aspin’s work on “Alice In A Strange Land”, in which he brings a strange jungle-wrapped lost city to life, alongside the British schoolgirls who have strayed into it. Weaker: I find the Ken Houghton art on “Tansy of Jubilee Street” to be adequate but unexciting. It can be stiff at times when the artist has intended an action sequence, which is bad news. But even excellent artists can have off-days, too: Jim Baikie’s art is normally top-notch, but in parts of “Miss No-Name” some faces and sequences are very patchy, and possibly even filled-in by another hand. Finally, even if the artist is generally good, a specific failure to draw ballet well will condemn the story in the eyes of those who can spot that, as Mistyfan commented on a previous post. Art style. The style of the artist needs to be matched to the story requirements. A light-hearted comedy story typically uses a more exaggerated style, and a sentimental or sad story might need something more restrained. This might be an editorial decision in commissioning the right artist for the job, but it might also involve the artist deciding to use a variation on their usual style. Mario Capaldi and Jim Baikie are examples of artists who had humorous and serious styles that can be readily distinguished not because they look radically different but by the exaggeration of the character’s actions and expressions. Weaker: I think I would choose the selection of Trini Tinturé in “Prisoners of Paradise Island”. Trini is an excellent artist for showing scheming and plotting elegant ‘bad girls’ rather than hockey-playing schoolgirls. Similarly, José Casanovas in “The Darkening Journey” is always a slight mis-match for me as his animal characters are beautifully drawn but a tad too intrinsically cheeky-looking for such a sad and dramatic story. 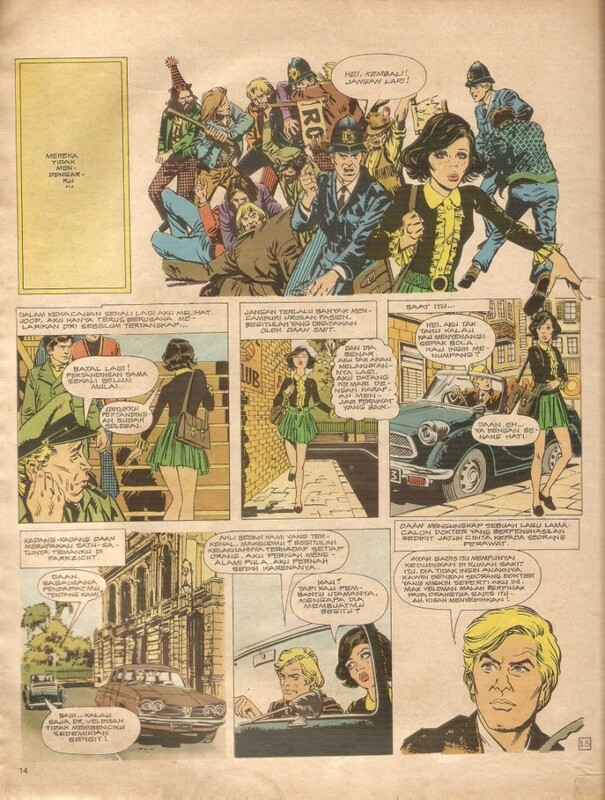 Finally, although I like Keith Robson’s art on “The Goose Girl” a lot, the Dutch publishers of Tina clearly felt that they wanted an art style that matched the continental expectations (such as a clear, clean line) as the same fundamental story was re-drawn in a Tina Topstrip. Consistency of art. If the artist or the quality of the art changes visibly during the run of the storyline then this will be noticed by readers and is likely to have a negative impact on how well the story works overall. If the artist is unwell or over-committed there might be a requirement for the editorial team to get another artist to fill in some or all of the remaining episodes of a story. Alternatively, another artist might perhaps collaborate to help finish the work in time (for instance by inking the original artist’s pencilled drawings). Presumably this might be an informal arrangement between artists if they were able to do this (for instance if they shared the same studio), but as there will have been people’s salaries at stake too I am assuming this was more likely to be an editorial decision to ensure that the story could be completed rather than abandoned. Stronger: I am not aware of any examples where an inconsistency in the artwork actually benefitted the story (for instance if a mediocre artist was replaced by a better one). Even if the art changed for the better, the change itself would be jarring and intrusive. Ongoing humorous strips such as “The Jinx from St Jonah’s” did tend to have a few different artists working on it over the years and this was workable as there tended not to be a single story that would be badly affected by this change. Weaker: This didn’t actually happen very often in Jinty‘s run. The obvious example is “Champion in Hiding” which started off with Mario Capaldi’s beautiful work and moved on to being drawn by Hugh Thornton-Jones, better known for his art on humour stories such as “Sue’s Fantastic Fun-Bag!”. Character design. Making the characters in a story look and behave distinctively on the page is partly visual and partly about their dialogue and actions. 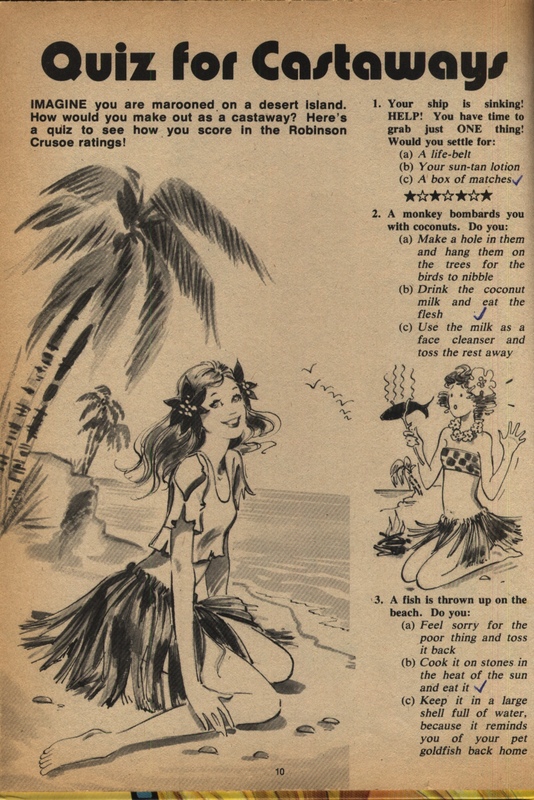 Is the result a solid, convincing character or can you hardly tell them apart from other characters in girls’ comics? Worse, can you hardly even tell who’s who in the same story? There is a lot of responsibility on the artist to bring a clear and distinctive visual identity to the character; at a minimum the inhabitants of the story should have different hairstyles, shapes, clothes that separate everyone out and make sure the reader is not confused. Ideally they should also have distinctive body shapes, body language and so forth too. The writer will have an impact too, in giving the protagonists an individual drive that will make them separate from others via distinctive dialogue and so forth. 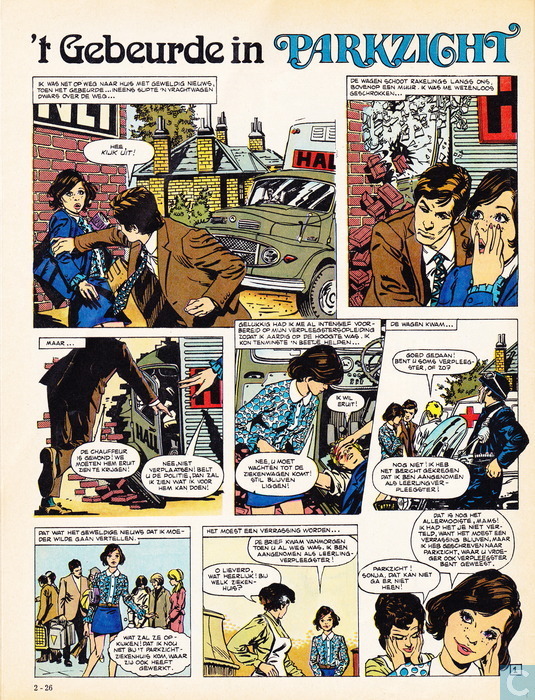 Stronger: Jim Baikie was a very long-running Jinty artist, illustrating many continued stories and one-off Gypsy Roses. He certainly reused hairstyles (Fran of “Fran’ll Fix It!” shared a hairstyle with the protagonist of this Gypsy Rose story) but nevertheless each of his characters is visually distinctive in multiple ways – body shape, body language, freckles, and so on. No danger of mistaking his characters even when they do have some features in common. Weaker: Comos’ schoolgirls across various stories illustrated by him have a bit too much similarity, I feel: I’d pick out the characters in “Destiny Brown” and the protagonists of “The Haunting of Form 2B” as being particularly visually similar. Layout. There is a lot of thought that goes into getting an effective layout at the level of the individual panel and at the level of the whole page. 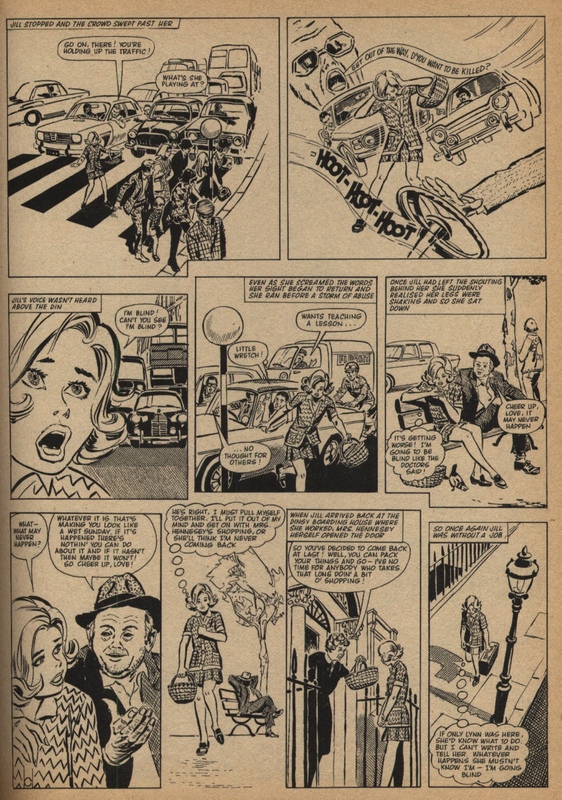 Wally Wood’s 22 Panels That Always Work gives an idea of the sort of panel layouts that a US mainstream comics artist might use to vary the visual interest on a page; the conventions and standards for British weekly comics may differ a bit but will share a lot of requirements for varying the focus in each panel. Page layouts likewise can be pedestrian or innovative, with varying sizes of panel within and artwork that breaks out of the constraints of the panel border. Again much of the responsibility of this lies with the artist, but the editorial team may also have input – for instance there may be a general instruction that pages should use a layout based on a nine-panel grid or on a six-panel grid to allow for larger panels. Pat Mills talks interestingly about working with the artist to create a dymanic page layout and strong panel layouts too. I don’t think that writers in this kind of comic usually would script down to this level (though in US mainstream comics they often will) but of course Pat was also an editor. Stronger: There are a lot of really good and interesting layouts in Jinty, Misty, and Tammy, perhaps more so than in other titles from the time. “Concrete Surfer” has some very dynamic and interesting layouts depicting the protagonist’s skateboarding tricks; “Land of No Tears” is slightly more conventional but often breaks the borders or uses irregular panels for a dramatic effect. Weaker: no immediate examples come to mind. Incidentals. I am using this to refer to little background details in the artwork or the story. This could be down to ideas from artist or from writer. Perhaps the artist will particularly need to fill the background somehow and may therefore put in extra detail either humorous or nostalgic. Stronger: For instance Jim Baikie includes little jokes in the background of “Fran’ll Fix It”: they may be joky signs or funny things happening behind the protagonist’s back. There may also be little touches of colour that the writer may also include; I have always remembered a bit of dialogue in “Merry at Misery House” where Merry says she’s “not as green as [she’s] cabbage-looking!’ This is not in fact anything invented by writer Terry Magee but it’s a nice touch of appropriate vernacular and always lived on in my memory. Weaker: It would be possible for the background detail to be over-egged and too intrusive. I can’t think of an immediate example that comes to mind however. Design / font / lettering. The lettering of the dialogue in Jinty and similar comics are all typed in a standardised font, without any big distinction between strong emotion and ordinary ones (there can be a slightly bolder effect used but with the low print quality on newsprint this is not very easy to distinguish). However, the logo for the story title itself is more distinctively rendered to match the story it heads up. There are also lettering elements in the artwork that can be done well or less well – shop-fronts, newspapers within the story, and so on. Unlike in other comics genres, sound effects (another possible element to be done well or less well) are not greatly used. I assume the story logo would have been done in-house editorially but this would need confirmation; I could also imagine it as supplied by the artist. The lettering would certainly be done by someone other than the artist as we can see by the consistency of the font used. Stronger: A number of the story logos have a fairly simple design just using a natty font, so anything more than this can be quite striking. I like the design of the “Fran of the Floods” logo, with plain lettering but the addition of rain and a pool of water. Weaker: Sometimes the logo font has no obvious sympathy with the title and just seems to have been chosen because it hadn’t been used particularly recently. “The Four-Footed Friends” is an example; nothing wrong with the story logo, but it doesn’t add anything extra. Format / edition / pagination. The Jinty stories were only reprinted by British publishers in annuals rather than in albums collecting the whole story together, but of course translated editions did exist that brought the whole of a story under the same covers. This could potentially mean that a story either feels stronger in reading it as a cohesive whole, or perhaps that weaknesses of pacing are more clearly felt and so the whole story works less well when read as a single edition. Alternatively, a story may even be entirely too long for some formats. Finally, the format also includes the page size and other publishing decisions – how many pages will be in that week’s issue? Which pages will be printed on the double-page spread at the centre, or on the front or back where you can only see a single page at a time? These decisions are all very specific to the individual printing of a story and don’t necessarily impact how a story reads over its lifetime over more than one printing. Stronger/ weaker: I have not got good examples of stories that could make a stronger or weaker impact depending on the editorial choices of edition and pagination, but perhaps a reader of one of the translated albums may have views based on that experience. My latest Jinty acquisition, thanks to Marc, and it complete several runs of Jinty stories in my collection. Among them are the last episode of “Darling Clementine” and the first episode of “Slave of the Swan”, the story of an amnesiac girl who falls foul of a spiteful ballet mistress who has a grudge against her mother. Next week we see another of Jinty’s classic stories, “Cathy’s Casebook”, and its blurb shows how well advanced the preparation for this story must have been. We are told that Cathy will save a lonely old shepherd, help an injured girl to walk again, stop a backward boy being persecuted, and solve an outbreak of food poisoning. In the other stories, things are stepping up. Paula’s beginning to realise how nasty she has been to everyone in the past and she is partly responsible for the mean treatment she gets from them now. But her efforts to change backfire and make her even more unpopular. And to make it even more interesting, her wrongly-convicted father has escaped from prison! Is it the key to clearing his name or just to add drama to the story, and his vindication lies with Paula and her puppets? In “Shadow on the Fen”, the witch finder turns up in the 20th century and Rebecca discovers how her friend Catherine took the witch-hunting rap for her at his hands in the past. Next week things are going to step up even more as the girls find out one of the witch finder’s secrets. The Zodiac Prince’s latest effort to help someone impresses his father this time, and next week he tries fortune telling at a fair. How easy can that be when you’re the Prince of the Zodiac? Or will it be harder than we expect? The Concrete Surfer wonders if she has got things wrong about Carol and is trying to be nicer. But is she doing the right thing or playing straight into Carol’s hands? And in “Waking Nightmare”, Phil Carey is blaming herself for Carol’s disappearance because she realised too late that Carol had a phobia about trains. Fortunately she finds Carol and now they’re off to her grandmother’s. But when they arrive, the occupants are definitely not Gran! What has happened?